Là-bas. Down there. Down there has many meanings in this film of Chantal Akerman, her first, last and only film set in Israel. Down there – geographically, perhaps. Down there, là-bas – down memory lane. Down there, in the abyss of memory. Down there, in the darkest memory of 20th century history. Of a family. Of the Jewish people. Akerman is not just in Israel. She is in a different world, a world of memories. She’s in the past. 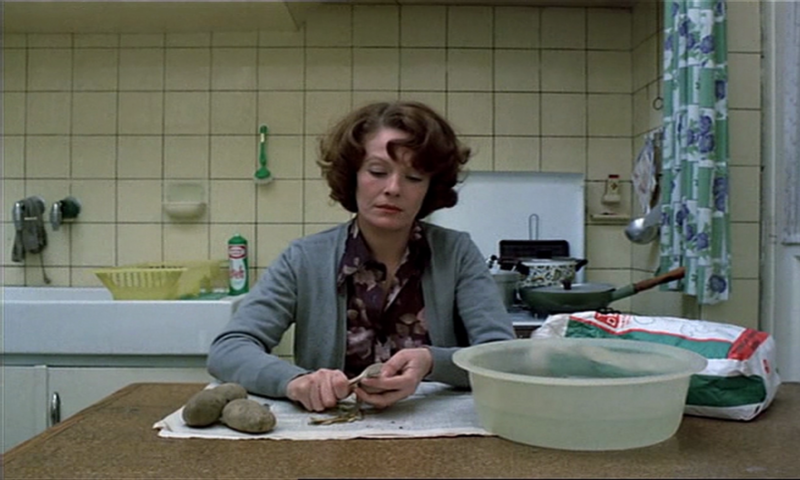 Akerman is like a ghost throughout the film. We can hear her make a coffee. We can hear her brushing her teeth. We can hear her footsteps. She’s there, and yet she isn’t. Her body is there. Her mind isn’t. She’s absent. She is là-bas. Speaking of exile, of suicide, of spending her childhood indoors in Brussels because her mother was too afraid of letting her out. She speaks of the childhood she never had, but could have had in Israel. She’s speaking of her aunt, who received electro shock therapy in order to deal with her depression. Towards the end of the film, Akerman speaks of a university professor who came to see her. He said: “It is difficult to get out of prison, especially out of your own prison.” Akerman’s film is almost entirely shot from inside the apartment she is living in, often through the same window, through the same curtains. Visually, this film is a prison. It hardly ever moves beyond the apartment window. Just like Akerman herself. In a voice-over she says that she doesn’t go out much. One reason is security. One day she went out and noticed that something wasn’t right. She asked a man what had happened and he told her about a suicide attack. But it’s not just that. It is not just the outside world. It’s also là-bas, the inner world, the inner turmoil, which imprisons her. In every word, in every phrase Akerman uses – French, English or even Hebrew – there is pain. There is sadness. There is depression. After this film, after everything I felt during those just over 60 minutes, I’m not surprised about the path she took on 5 October last year. It’s all there, in Là-Bas, which she had completed nine years earlier. There aren’t many words I have for this film. What I do have are feelings, and it is impossible to put them into words. Là-bas made me thoughtful about many things, and I would urge my readers to watch the film if they’re not familiar with it. It is an important piece in Akerman’s filmography and deserves to be seen as such. If you study Slow Cinema, or time in film in more general terms, you cannot avoid reading Mary Ann Doane’s The Emergence of Cinematic Time (2004). It is a kind of bible for those who are interested in how cinema came about, although I do find it, in fact, too little concerned with cinema itself, and more with everything that came before. I haven’t managed to read the whole book yet, though, but I’m definitely missing something there. “One could argue more generally that at the turn of the century time became palpable in a different way – one specific to modernity and intimately allied with its new technologies of representation (photographs, film, phonography). Time was indeed felt – as a weight, as a source of anxiety, and as an acutely pressing problem of representation” (2004: 4, original emphasis). Writing this, Doane had an increased speed in the arts in mind. Again, Futurist art is for me the point when speed became so evident that you could not avoid it anymore. It was everywhere. Speed, or rather the passing of time and therefore the seemingly increased pace of walking towards one’s own death caused anxiety, and made people move even faster, because they thought that they could accomplish more if they just did things faster. Indeed, many people – me included – have problems to be in bustling shopping centres or high streets, where everyone is walking swiftly from one shop to another, always on the phone. What I find interesting is that Doane links this anxiety to speed. I do not argue against her statement. It is more than appropriate. But how about anxiety felt in Slow Cinema? Slow time as triggering anxiety? When I read this passage in Doane’s book, I returned to my paper on the concentrationary universe in the films of Lav Diaz, in which I argued that Diaz created ‘time terror’ for both the characters and the viewer. In his focus on trauma and history, Diaz is surely an extreme example of using slowness as a means to create anxiety. But there are more directors, who use slow time to show the actual ‘weight of time’ as Doane put it. How much time do we spend waiting when we watch a slow film? How much time do we spend wondering what is going to happen? And with that, how much time do we spend seeing characters suffering? This anxiety is also visible in Pedro Costa’s films, a fact that makes for an interesting point. The weight of time, infused by slowness, is the weight of the past. It’s the opposite of what we saw with Futurist art, where time was more infused by the weight of the future. Slow films (not all of them) look back to the colonial history of the countries they are made in, and it is not only a traumatic history, which still wears heavy on local populations. It is also a degree of standstill. Can these people – the former colonised subjects, the people depicted in those films – move forward? Can they move at all, or does the weight of time, of the past, prevents them from doing so?